Silver is rising and will continue to do so over the next few years. Canadian Silver Maple Leafs are one of the world’s most recognized silver bullion coins. First minted in 1988 and struck every year since, silver Maple Leafs contain one troy ounce of pure silver. Minted in .9999 fine silver, Canadian Silver Maple Leafs are among the purest of all silver dollar-sized coins. Maple Leafs are magnificently designed, with attention to every intricate detail. This has made the Silver Maple Leaf highly desirable by investors and collectors alike. 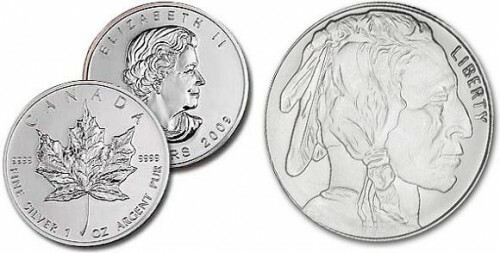 Silver Maple Leafs offer several advantages over other silver coins. The coin is ‘official legal tender’ with a face value of $5.00. Also, its content, weight and purity are guaranteed by the Canadian Government. In addition, they are typically priced less than other bullion coins such as the Chinese Pandas, Australian Lunar coins and the American Silver Eagles. When we were telling people that Silver was going to double, we were wrong. It quadrupled in less than 2 years!!! Silver is on the rise, out performing gold. Silver at the time of this posting is at almost $42 dollars an ounce! We think that it will double again within 1 year. Either way you should have silver and gold to protect yourself and your family.